Mail.app as alternative to Thunderbird? For the last couple of days (actually since I noticed, that Mail.app is now finally able to work with Socks5 proxies) I started considering Apple’s Mail.app as an alternative for Mozilla Thunderbird for my daily mail usage. No integration into the MacOSX AddressBook, which is in my opinion a more flexible solution than what Thunderbird offers. It highlights messages that are part of a thread also without using the threaded view. It is always clear from what mail account a mail came thanks to a simple division of the main inbox into subfolders for each account. 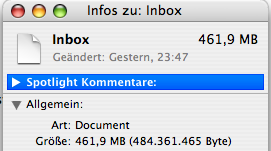 I like Mail.app’s sidebar more than the one of Thunderbird. It would be nice, if you could somehow expose the “Local Folders” when you don’t use any other top-level folders for accounts. Like Firefox compared to Safari it has a huge development community offering tons of add-ons. The fishing protection and basically spam protection in Thunderbird feels a little bit more solid to me. It for example blocks images in mails from senders, you don’t have in your address book. In Mail.app you can only disable images in general and then load them explicitly for each mail. Somehow in the gray area for me is Mail.app’s GnuPG support. I found GPGMail but I haven’t yet tried it (installed but not tried).